How do Salimetrics assays work? All of our immunoassays (apart from alpha-amylase) are competitive immunoassays, meaning that the signal obtained is indirectly proportional to the concentration of the analyte. The higher the concentration of the molecule in the sample, the weaker the signal will be. Antibodies specific to the analytes to be tested are coated to a microtitre plate. 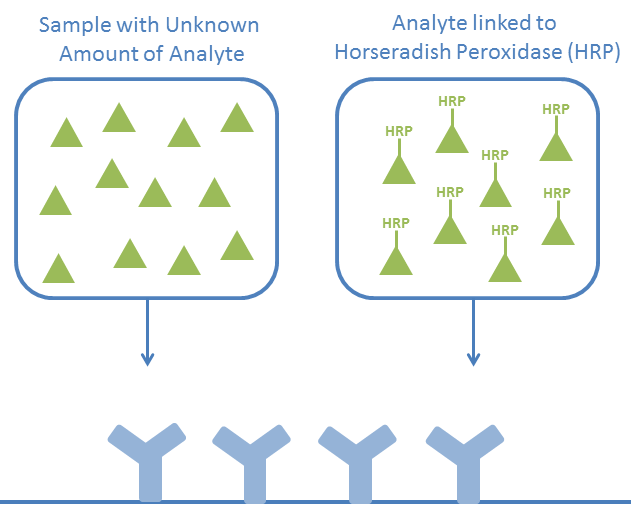 A mixture of your sample (including an unknown concentration of the desired analyte) and the desired analyte (conjugated to HRP) are added and compete for the antibody binding sites. The microtiter plate is washed and any unbound sample and conjugate are washed away. The substrate TMB is added and reacts with the conjugate, yielding a blue colour. The reaction is stopped with sulfuric acid and the colour intensity is measured. The colour formation is indirectly proportional to the amount of analyte in the sample. As mentioned before, the kit for alpha-amylase is a kinetic assay, measuring the enzymatic activity of alpha amylase. The increase in absorbance is directly proportional to alpha-amylase activity and hence alpha-amylase concentration. Saliva with unknown amount of alpha-amylase is added to a microtiter plate. The chromagenic substrate 2-chloro-4nitrophenyl-a-D-maltotrioside (CNPG3) is added and hydrolized by alpha-amylase to yield 2-chloronitrophenol (CNP), chloro-4-nitrophenyl-a-D-maltoside (CNPG2), maltotriose (G3) and glucose (G). After 1 and 3 minutes, the formation of CNP is spectrophotometrically measured at 405nm. The rate of formation of CNP is directly proportional to the alpha-amylase activity in the sample.